• There are plans for more phone masts in Redbridge, including one near Snaresbrook primary school. While some people still have concerns about health, but the demand for mobile phone coverage continues to grow. A BBC survey last year of areas without reliable 3G coverage found a sizeable gap around Hermon Hill (pictured) which a new mast might address. • Parents wanting their children to enter primary schools in Wanstead have until next week to submit their application (via www.redbridge.gov.uk/eAdmissions). 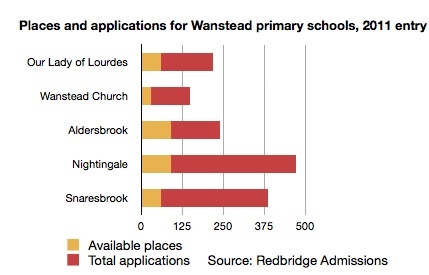 As these figures below from the 2011 entry show, Wanstead schools are much in demand. The main criteria for application to non-faith schools are whether children have siblings already at the school, and how close they live to the school. Though each of Wanstead’s two faith schools technically will admit children not of their faiths, the figures show that for Our Lady’s, out of 60 children, 36 were baptised Catholics and 26 who were baptised Catholics with siblings in the school. For Wanstead Church school, out of 30 children enrolled, 27 came from families ‘at the heart of the Anglican church’, two from families ‘committed to the Anglican church’ and one who had a sibling in the school. • The Wanstead and Woodford University of the Third Age, for people who are retired, semi-retired or no longer working full-time is holding its inaugural meeting on Tuesday. • A beagle which was found in Wanstead earlier this week (and about which there was much tweeting) has been reunited with its owners. Anyone can add an event to the Wansteadium Events calendar by sending details to events@wansteadium.com. Wansteadium now has more than 1,200 regular followers in Wanstead so it’s a great way to let people know what’s going on.